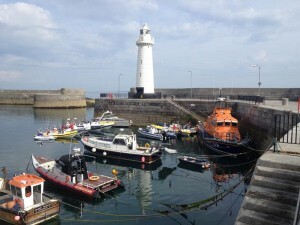 The Annual Bangor and Donaghadee to Portpatrick Ribraid this year included a boat cruise to Belfast and tour of the Crumlin Road Gaol followed by the now traditional trip to Portpatrick on the Mull of Galloway in Scotland. A fabulous turn out of twenty nine different craft and over one hundred people attended the event, some travelling from as far away as Meath in the Republic of Ireland, the Isle of Man and Scotland. Guests enjoyed a wonderful breakfast in The Salty Dog, Bangor, before departing by boat up the Belfast Lough to be entertained by an informative tour of The Crumlin Road Gaol before returning to the hospitality of the Ballyholme Yacht Club. 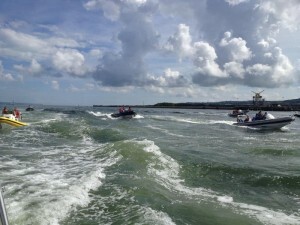 Sunday saw the annual Rib dash from Donaghadee to Scotland where Ribsters were entertained by Stranraer’s Elvis Impersonator Ricky O’Boyd before returning to Pier 36 in Donaghadee for a barbeque and prize giving that saw Mid-Ulsterman Melvin Davison received the Skipper of the Year trophy. International Ribraid was setup over ten years ago to promote and encourage the sport of Ribbing and allow boat owners to make trips in the safety of other experienced RIB owners. RIB stands for Rigid Inflatable Boat, a type of watercraft prized for its speed and safety through rough seas. RIBs traditionally had commercial, industrial and military uses however have become extremely popular as a great leisure and family boat. The Ribraid would like to take this opportunity to thank all sponsors including The Salty Dog, Pier 36, Galloway Marine and Ardnet Online.